Become a wrestling superstar when you play the new Microgaming slot at 32Red Casino with a Super Wild feature, Multipliers, Free Spins, and more. Lucha Libra, which literally translates to freestyle wrestling or free fighting, is a term used in Latin America to describe professional wrestling. This exciting sport was first introduced in Mexico during the early 15th century and has since evolved into a one-of-a-kind wrestling form that is characterized by colourful masks, high-flying manoeuvres, and rapid sequences. Microgaming decided to use this insane sport as the theme to their new slot called Lucha Legends. Microgaming's new Lucha Legends slot consists of 5 explosive reels with 3 rows and a whopping 23 non-adjustable paylines. The action unfolds in front of a Mexican wrestling ring and boasts with a plethora of exceptional slot features, such as multipliers, wild symbols, free spins, scatter symbols, and a Super Wild feature along with a top jackpot prize worth 6 times the total bet size. 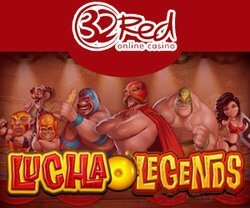 The new Lucha Legends slot can also be enjoyed on PC and the 32Red mobile casino platform. The game logo in the new Lucha Legends slot in gold and red colours will act as the wild icon on the reels, standing in for all symbols, apart from the scatter symbol, to potentially form a winning combination. The gold wrestling belt will act as the scatter icon on the reel set and will activate the free spins round embedded in the game. Players will be required to land at least 3 gold wrestling belt scatter icons on the first, third, and fifth reel to trigger the free spins round. Once the free spins round is triggered, players will receive 10 initial free spins. Should players be able to land an additional 2 or 3 gold wrestling belt scatter icons during the free spins round, the game will award players with an extra 1 or 10 free games, respectively. Microgaming's Lucha Legends slot also comes equipped with an innovative Super Wild feature which can be randomly triggered in both the free spins round and the base game whenever a player lands a winning combination that contains a game logo wild icon. Should players have luck on their side, a Mexican wrestler will appear on the reels, performing an incredible move while turning a regular wild icon into a Super Wild icon which can either award a 2x or 3x multiplier or create a wild icon that is 3 symbol positions wide. The slot further impresses with an additional Power Up Mode which players can activate at an additional cost. The Power Up Mode will essentially boost a player's chances to receive the Super Wild feature. When the Super Wild feature is triggered while the Power Up Mode is active, the transformed wild icon will be 5 symbol positions wide or a player's winnings will receive a 3x or 5x multiplier value. The pay table in the new Lucha Legends slot is packed with Mexican wrestlers which players will meet when they sign up for a 32Red Casino bonus. The most incredible wrestling duo on the reels is Pepe and Sal, paying the highest jackpot prize worth 6 times a player's total bet. Players will also be greeted by Judge Ricco as the wrestling referee, Violeta as the wrestling ring girl, Burro, El Diablo, and Martio. The remaining symbols include high valued playing cards, ranging from Jack through to Ace. Microgaming's Lucha Legends slot comes equipped with 25 fixed paylines and will pay left to right. The slot also gives players the ability to choose between Power Up Mode or Normal Mode. Players need to keep in mind that the Power Up Mode will double the overall bet to increase their chances of triggering the random Super Wild feature. The slot offers loads of flexibility when it comes to betting options with a minimum bet per spin value of $0.25 along with a maximum bet per spin value of $75.00.